Lupita looked the best she’s looked since her Oscars moment, I’d posit. The inspiration was ’40s glam with a modern, effortlessly chic edge. 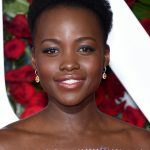 Makeup Artist Nick Barose gave Lancôme Ambassadress Lupita Nyong’o a bold red lip, paired with luminous skin and elegant, elongated brows. Here, the products used to achieve Lupita’s luminous look. Yay or nay or Lupita’s look? And that dress? STELLAR.